Gary Markstein is a nationally recognized and versatile graphic designer, illustrator and syndicated cartoonist. He began his cartooning career while doodling in the margins of his grade-school homework. One of his first caricatures was of Richard Nixon, drawn in a fifth-grade drafting class. "My classmates went crazy over it, and I was hooked," he says. Markstein majored in graphic design at Arizona State University, where he drew a popular comic strip for the college newspaper. In his editorial freelance work no political figure was safe from his cutting-edge commentary. This resulted in national syndication with Copley News Service. Not long after, he landed his first job as editorial cartoonist for the Mesa Tribune in Arizona -- all steps on his path to award-winning work as political cartoonist for the Milwaukee Journal Sentinel. Numerous editorial cartoon and design awards include the John Fischetti Award in 1997, Global Media Award 2001 and 2002, second place 1995 National Headliner Award, the Ranan Lurie/United Nations Editorial Cartoon Award in 2004, plus many Society of Newspaper Design Awards. Markstein’s work has been featured in many publications, including Newsweek, Time, and U.S. News and World Report. His illustrations have appeared in Sports Illustrated, Golf Digest, Discover and Astronomy magazines. 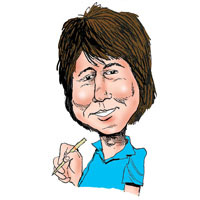 Along with his editorial cartoons, Markstein is the co-creator and artist of the nationally syndicated comic strip, "Daddy's Home," for Creators Syndicate. The strip appears in the Milwaukee Journal Sentinel, Lexington Herald Journal and other news sites across the country.